Is Your Dog Getting Enough Vitamin B6? Vitamin B6 is one of those cool nutrients that your dog needs. It not only helps in his growth it also promotes his overall well-being. And the best part is that Vitamin B6 in dogs is available in a variety of pet food. Pet food companies promise that their products have the right amount of minerals and vitamins. However, any raw dog food enthusiast would tell you that it’s a marketing gimmick. Your pooch stands a better chance of getting enough vitamin B6 by eating the food you cook at home. However, this does not dismiss commercially-bought kibble altogether. There are brands of dog food that genuinely pack enough pyridoxine for your dog. The only downside is that it can get expensive buying these products. In such a case, it makes more sense to buy pet supplements that contain adequate amounts of Vitamin B6 for your dog. And this option is always cheaper. So if you are sticking to kibble, do add a pyridoxine supplement to ensure your dog gets all his vitamins. Dogs that are on a raw diet are, by far, reaping the benefits of Vitamin B6 than those on kibble. This is because the vitamin is abundant in raw food before it gets depleted through high heat (or cooking). So turn off the stove and introduce your dog to a diet filled with lean meat and bones. Vitamin B6 is abundantly found in pork, beef, chicken, turkey, sardines, and salmons. In addition, the vitamin is also found in organ meat such as heart, liver, and kidneys. Eggs too contain healthy amounts of pyridoxine for your dog. While feeding your dog meaty bones, also introduce him to some veggies. Avocados, lima beans, spinach, kale, and carrots. Broccoli is great too but if your dog doesn’t like it just let him chew through a juicy piece of watermelon. Voila! Vitamin B6! Though we cannot unpack all the benefits of pyridoxine here, we definitely can mention the major ones. To begin with, Vitamin B6 is necessary for protein synthesis to facilitate the healthy growth of your puppies. In addition, this vitamin triggers the secretions of hormones responsible for internal physiological processes and the general mood of your dog. Pyridoxine facilitates adequate absorption of fats and proteins. Moreover, Vitamin B6 in dogs helps in maintain a potassium-sodium balance in your dog’s body. This in turn assists in water regulation ensuring your pooch maintains a well-toned body. Vitamin B6 promotes healthy brain function and the production of red blood cells. Furthermore, the vitamin also aids in the absorption of vitamin B6 and the synthesis of DNA & RNA. Vitamin B6 has been directly linked to heart health in dogs. Enough amounts of the vitamin in the blood stream regulates the level of homocysteine. This is a chemical that has been associated with the hardening of arteries leading to heart failure in dogs. So your dog has everything to gain by consuming a diet rich in pyridoxine. Vitamin B6 in dogs is readily available in pet supplements or quality raw dog food. 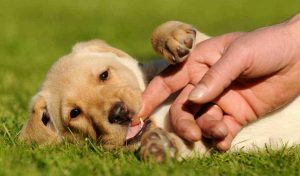 The dosage of the vitamin may vary with your dog’s size, breed, and age. However, professional vets do recommend 0.1mg of pyridoxine per every pound of your dog’s weight.